This was a magical night, another reminder of what extraordinary entertainers the Rolling Stones are. After fighting through Southern California traffic and reaching the sterile little stack of concrete that the Honda Center is, I wondered how the show could possibly be good given the complete lack of ambience or personality for the city or the venue. The police certainly did not help on the streets bordering the arena, on loudspeakers actively threatening to ticket anyone crossing the street outside of designated walks, while letting droves of people cross access roads to California Highway 57 unsupervised and without protection as traffic whizzed on and off ramps at 50+ miles per hour. With horrible public safety priorities like this on display, indeed every cop is a criminal (and all the sinners saints). A hint that the evening would be amazing was on the opening song Get Off My Cloud, with Keith booming out chords, draped in the long beige/black/red scarf that he has closed shows with on this tour, looking like some American Indian elder ready to perform a tribal ceremony. John Mayer was the special guest, and this was no surprise as it was announced on Twitter well before the show. Mayer was nothing short of brilliant, by far the best guest so far in 2013. He appeared as a guest in 2012 at both Newark shows, on Respectable and Goin' Down, so it was easy to think it would again be on one of those songs. However, Mayer took on an ambitious task, guesting on Champagne and Reefer, a blues song Buddy Guy was on at the Beacon Theater in 2006 and that Muddy Waters performed with the band at the legendary Checkerboard Lounge show in 1981. Unlike the Newark shows, Mayer was medically cleared to do vocals and took his turn, singing, "Every time I get high, I lay my head down on my baby's chest". This lyric was inconsistent with the Muddy Waters and Buddy Guy versions, which say "baby's BREAST", rather than "baby's chest". John could certainly be excused for that lyrical error, as anyone who saw Katy Perry's Grammy Awards dress would not doubt his credibility on such matters. To be serious, it is a shame the tabloid popularity of Mayer's relationships draws attention away from what a great blues guitar player and singer he is. His recent recordings (check his version of Crossroads from 2009), and appearances at concerts with the Stones and Clapton put him in the forefront as heir apparent in the tradition of blues players, ahead of Gary Clark Jr, Warren Haynes, Derek Trucks, Robert Cray, etc etc. His balance of vocals and guitar style make him a worthy partner to be on stage with the Rolling Stones. Rocks Off was a big surprise, and the Stones ripped through it with joyous abandon that did justice to the recorded version on Exile on Main Street. Waiting on a Friend was even better, just a perfect take with Tim Ries doing a really nice saxophone solo, reminiscent of Sonny Rollins on the Tattoo You album, and Ernie Watts on the live versions of the 1981 tour. Lisa Fischer provided the lilting background vocals, freeing Mick from his quite capable falsetto so that he could sing the lead with captivating desperation. The mood during this number was unbelievably great, and it was clear that the band answered any questions about how Anaheim could be a fantastic place for a rock 'n' roll show. The two new songs fit nicely into the set, as I was happy to be interrupted after Doom and Gloom by a woman behind me saying, "Is that a new one?! It's really good!" One More Shot was a fine companion piece. To hear Keith sing the, "I love I love I love ya" back up vocals gives the song a classic Stones sound, where it would not be out of place if seen as a black and white vision from the Ed Sullivan Show. 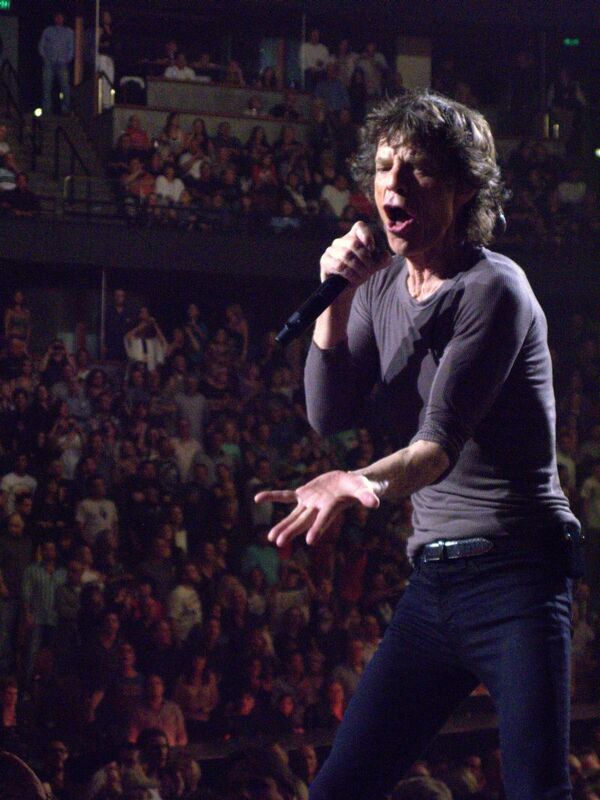 Mick Jagger was his usual comic self, describing Anaheim/Orange County as "Like L.A., except everyone has dogs". During band introductions, he coaxed Charlie Watts out from behind the drums toward the front of the stage, declaring with a sweep of his arms toward Charlie, "He's come this far in fifty years!" An additional nice touch and improvement was that Tumbling Dice was light on the cartoon animations (just showing dice graphics at the end), with images of the actual performance being shown on the video screen. The encore was better than any on this tour, with the USC Thornton Chamber Singers starting off You Can't Always Get What You Want. One thing I noticed tonight that makes the choir guest appearances so good is the way Keith interacts with the vocal performers. In the 35 years that I have seen Keith work a stage, one of his most outstanding abilities is to draw fellow performers further into the show, to get people into it, and to get those already into it even further into it (no matter if it is a high profile guest, Darryl Jones, or huddling with Charlie in front of the drum kit). Keith was thorough in the attention he paid to each stage side of the choir, squaring off to display his guitar licks to the singers, focusing their attention as they balanced enjoyment and being overwhelmed with the reception from the crowd. It was a masterful job of leading the entertainment, capped off with the familiar Keith arm/head/heart gestures directed at performers who completed a job well done. The night concluded with Mick Taylor on Satisfaction (his second song of the night along with Midnight Rambler), with Taylor playing as a cigarette burned in between the tuning pegs of his guitar. It is enjoyable to see Taylor act as a showman beyond anything he did in his shy performances of the 1960s and 1970s, including sharing a microphone tonight with Darryl Jones to sing backups on the song. There were definitely a few scattered empty seats tonight, and I'm sure critics will seize upon that as some symbol of failure, or revenge for high ticket prices. But tonight was a great reminder that what is important is what is happening on stage, and just when you wonder how the Stones could top L.A., or Oakland, or Vegas, they turn Anaheim into the rock and roll capital of the universe. This band never ceases to amaze me. Been watching them since 1975 -- somewhere around twenty shows. Last night was simply incredible. We had tickets in the pit. Got there at 4:30P, cued up outside and waited. We were lead in and then waited in the main level of Anaheim Pond another 20 minutes. Meanwhile grabbed a beer and now we're OK. Finally we are led into the Pit. Lots of room. SRO. We immediately set up camp on Keith's side three feet in front of the stage. But wait a minute -- what's this? Charlie's still on stage adjusting his drums! We yell and wave to Charlie, he waves back. After he finishes he walks up to center stage and tosses one of his sticks to those lucky folks over there. Then he comes right over to our side, tosses a stick and I grab it! I immediately hand to my friend John who is a drummer. What a start! A GREAT OMEN! Now we are waiting and chatting with like minded Stones fans. And Guess who is in front of us -- Mr. IORR himself! HI BV. Great job with the site. Keep on Rockin' in the Free World Baby! Get Off My Cloud: - The engine starts , the plane lifts into the sky and away we go. Keith is playing along holding back a little. IORR (Homeage to Mr. IORR himself?) - Nice rock beat. Keith rips off the Chuck Berry Licks and we are cooking. Paint It Black - Now we are talking. This thing is on fire. Keith delivers the intro, Charlie comes in with The Tom Toms and we are all back in the Dark Jungles of 1966, with no colors anymore. Gimme Shelter is next. Keith starts the pearly guitar riff and Mick and Lisa deliver. Just a great song. Then, at the end, Keith walks over to our side and lofts his pick...my buddy Jeff grabs it and hands it to me. Heaven can only only await me now as I have a Keith Richards embossed Rolling Stones pick that he used on Gimme Shelter! Rocks Off - Yeah! A New one from Exile and it is clear that we are ALL getting our Rocks off while we're sleeping. Another new one to the set - Waiting on A Friend. Good Song. No special moments between the two friends the song is about though. No real Keith singing at this point. In LA on Opening night he had a microphone out there and was singing along in all the usual parts in great voice. Not tonight. At least not yet. Now its Guest time - John Mayer, "Champagne and Reefer". Not expecting much on this but it really turns into a great jam with Keith being driven on by Mayer's fiery licks. This song delivered. Emotional Rescue. Sorry, this song just does not do it for me. Oh well. Doom & Gloom - Mick's newest and he brings out one of his telecasters with only 5 strings and you can tell who he learned this style from. But it rocks and the guitars tie in. One More Shot. Interesting dichotomy. Mick clearly started the last one with his opening riff. Now Keith walks over to us, pauses a beat and then hits the opening 5 string assault on HIS new song. And again, this one moves and grooves and we are into it. Honky Tonk. Keith starts the song the same way - just hitting those strings with no chording - the guitar is already tuned naturally to a G chord -- and then he hits the opening lick. We all sing the chorus as per the original record with the "Haw-haw-aw-aw-aw-aw-onky Tonk Women. Gimme, Gimme, Gimme The Honky Tonk Blues!" Keith hits the solo and is all over it and moves over to Ronnie's side of the stage. Great Version. 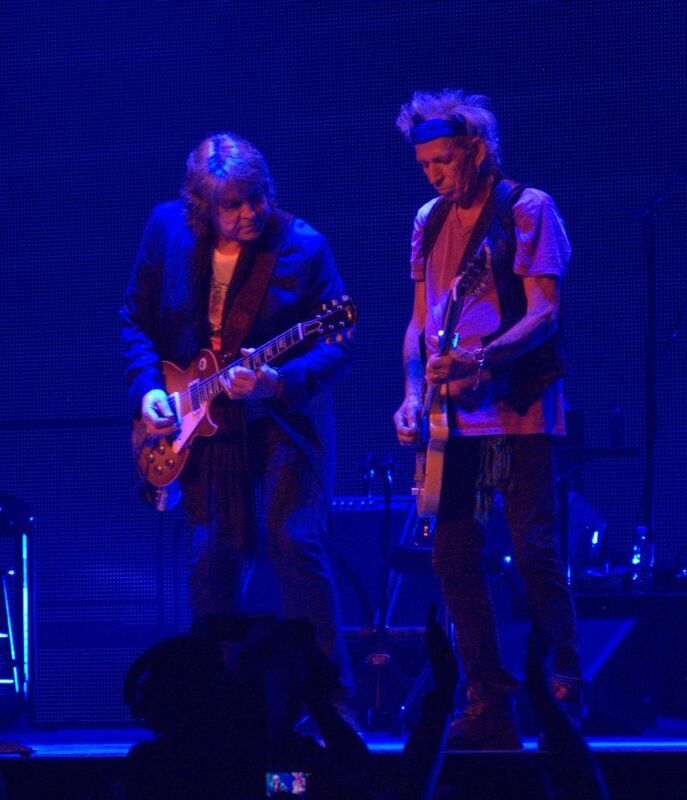 Somewhere before these last few songs there was a great moment between Mick and Keith. I can't remember which song it was..Sorry. But Mick was getting ready to take a run around the Lip. He turned and kind of jogged over to keith and touched him on the arm and nodded like "C'mon. Follow me." Keith looked up for a second and then took off after him and they raced around the lip, Keith following Mick. Just Two Little kids from Dartford Again. Sweet. Keith - Before They Make Me Run - Singing EVERY WORD as LOUD as I can. Such a great personal song. Great soul and he sings and plays the whole thing. Happy - Keith again and this thing kicks arse. Another great sing along. Mick Taylor Time. Midnight Rambler. Long Killer version with Taylor weaving around Ronnie and Keith's riffs. Honey, It's not one of those shows! Miss You. I'm sort of over this song at this point, but great bass solo and great Harp soloing from Mick J. As well as on Rambler. He is really good at the Licking Machine. Start Me Up: Home Stretch Keith Chordage in G - Yah Mon. This could be the unofficial Zombie National Anthem: You Make A Dead Man Come! Tumbling Dice: Ya Got to roll me and call me the Tumbling Dice. We have been ROLLING all night. Brown Sugar: Interesting note on this song, which seems so classically Keith in its riff and chord structure, Mick Jagger came up with this song and the whole riff on guitar. There is actually footage of him jamming it out backstage during the 1969 tour. Sympathy: The less guitar driven version they have been playing of late where the rhythm is driven by the piano and bass. Keith is laying back behind Charlie's riser having a smoke waiting for the first "Please to Meet You" and then he jumps out, hits that chord and starts playing lead. He is on it and it is solid and he drives the tail end of the song. Nice leads played with great passion by Keef. End of concert. Great moment between Keith and Charlie. As the crowd is roaring, Keith walks over to the drum riser and offers a hand to Charlie to stand down. He takes it - Measure Twice - Cut Once! YCAGWYW: This is great with the USC Choir backing them up. I would have to say they were better than the UCLA choir...but I am a Trojan Alumnus! This song just sounds great. French horn, Keith's opening guitar intro. Everything about it Just Great. JJF: Keith starts it and looks down at us with that look - the same one he had when that Knucklehead tried to run on stage in '81 and he pulled his guitar off his shoulder and clobbered him -- Just Pure Menace. But all directed at that riff. A nice way to channel it, baby. 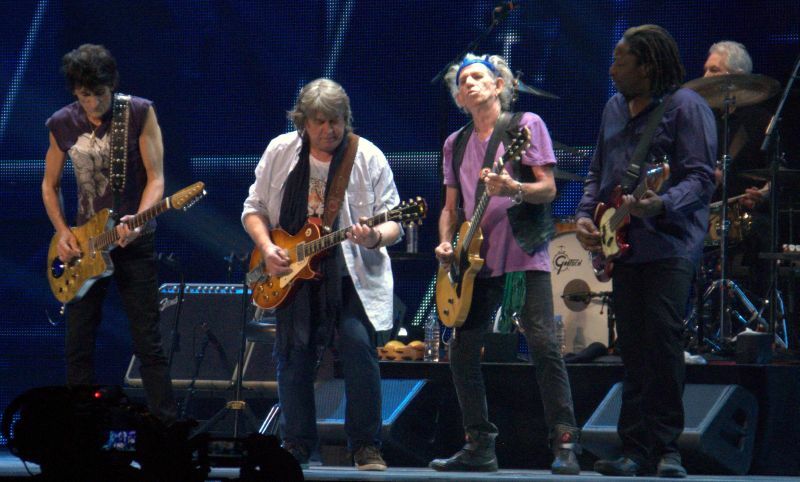 Satisfaction: Mick Taylor joins in but his guitar is not in the mix. When he plays a solo and he walks over to Keith and says "I can't hear me at all". But no matter the riff is the thing and the riff is all Keith. And We can't Get NO! It was a great show last night. The Pond or whatever it is called now was slow filling up. By showtime just all the seats were taken. The ticket prices, the Stones old age and the set lists didn't matter by the time the Rusted Wreck hit the stage with GET OFF MY CLOUD. It sounded young and vicious just like 1965. A perfect opener. Then they did IT'S ONLY ROCK AND ROLL to get their Berrychuck fix in. I have never heard it better. 2 songs in and the night already felt magical Keef sounded like he had been drinking from the fountain of youth. Something funny happened at the beginning of PAINT IT BLACK, Keef played his intro and then turned to Charlie to signal when to come in and he did it with a huge cheshire cat grin. WAITING FOR A FRIEND started kind of wobbly but it righted itself and was magnificent. One of my favorite Stones songs and I finally got to see it LIVE. Say what you will about John Mayer but the kid can blow. CHAMPAGNE AND REEFER is becoming a Stones songs. The Jag played some mean harp, too. EMOTIONAL RESCUE danced and DOOM AND GLOOM and ONE MORE SHOT sounded like classic Stones song. All churning guitars, booming bass and Charlie's drums. It was cool to hear the cowbell at the beginning of HONKY TONK WOMEN, I know it isn't '69 but it was still cool. Great version too. The Jag's introductions were funny, he brought Charlie to to the front of the stage and said that it has taken 50 years to that. Then it set in, 50 years playing Rock and Roll. Who would have thought during the Summer of Satisfaction, that the Stones would still be around in 2013. Rock and Roll was not suppose to last. Mick Taylor came on MIDNIGHT RAMBLER and it was a good as advertised. Maybe he should be part of the introduction, after once a Stone always a Stone. MISS YOU got the crowd dancing and from there on out in my section everybody was standing. Then it was time for the Fossil Medley, the war horses. People can complain about them all they want to but when they are played right, they all pretty damn magnificent. They sound so much better now that they have been slowed down a bit. My favorite part of just about any show is when the crowd does the WOO part in BROWN SUGAR with the Jag. It's always goosebumps time. The Rusted Wreck got sentimental and took a look back on the first encore of YOU CAN'T ALWAYS GET WHAT YOU WANT. 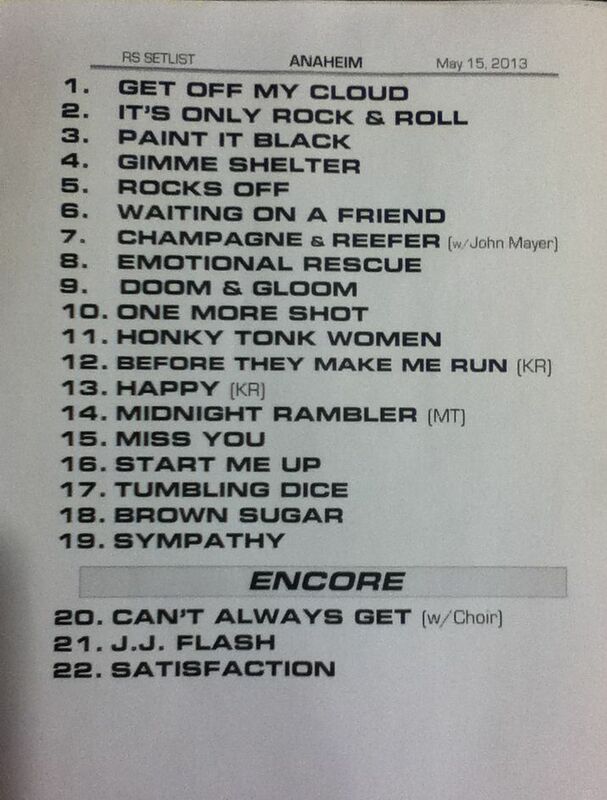 JUMPIN JACK FLASH and SATISFACTION closed out the night. What it boils down is, if the Stones can't rock you, nobody can. Last night they ROCKED. In the video stories played on large screens before the band took the stage last evening, Iggy Pop said seeing the Stones live is "like getting hit with a dead mackerel." While I don't listen much to what Iggy has to say, he was accurate in this description. I got whacked last evening in Anaheim in the most enjoyable way. After 31 years of following The Rolling Stones, seeing them in 14 different cities for 20-something times, you wouldn't think there would be any surprises left. But I was caught again in Anaheim by how well they blew it out with crisp rock and blues throughout for their 50th year in rock and roll. Highlights included Lisa Fischer's soaring vocal on Gimmee Shelter, along with John Mayer stepping up front to wail away and sing Champagne and Reefer. The insertion of Rocks Off was superb, as my friends Earl, Rob and I were discussing gems like that on the way to the show that we'd like to hear. Mick Taylor took control on Midnight Rambler and I wish they would use his skills on some other tunes that he contributed to many years ago. And finally, it was a treat to hear Waiting On A Friend, despite the fact that there were gaffes throughout which left Mick a bit pissed at the end of the song. Speaking of Mick, he never ceases to amaze and entertain me. The guy still prances, runs, dances, shakes and shimmies throughout the show, keeping the crowd involved without much rest. Keith appeared tired to me, with some bursts for his two lead vocals, and Ronnie had good fun extending his introduction. Charlie came out for his intro and went from his usual front of the drum kit, all the way to the front of the stage. 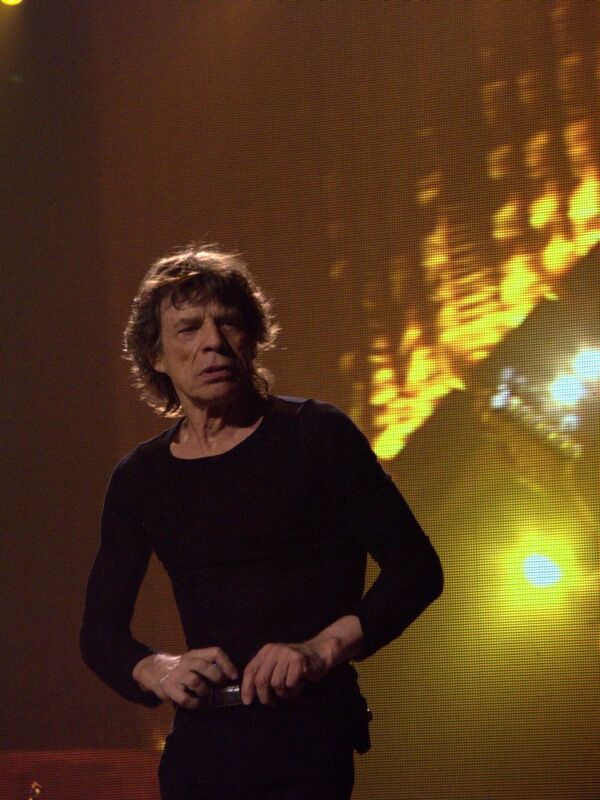 Mick said "it took fifty years to get him out this far". "50 and Counting" is the theme of this tour, which is what I will be doing this coming August. For now, the shows continue and I'll see them again in Philadelphia on June 18. The adventure continues!